The following is an explanation of several projects including the requirements, constraints and finally the solutions employed to successfully complete each one. 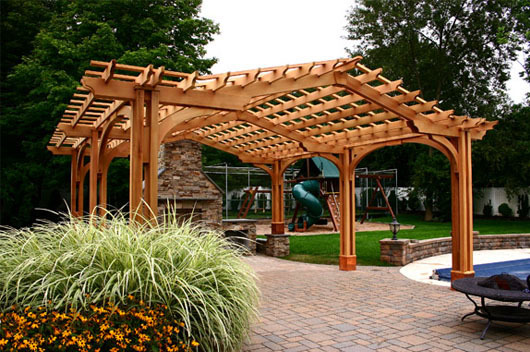 We pride ourselves on incorporating the correct engineering for each project and welcome future unique design challenges such as these. 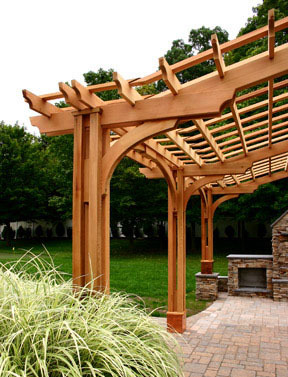 This structure, a successful collaborative effort with the client, incorporates many facets of a pergola into a unified, functional whole. 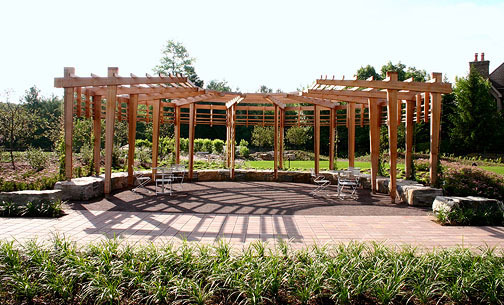 The pergola is located on the sunny front of the house overlooking a river valley. 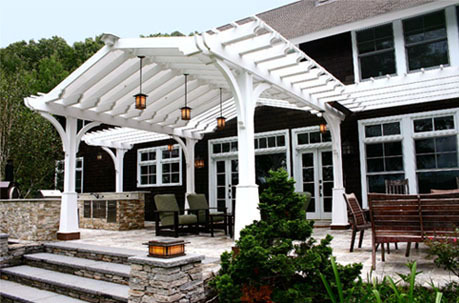 It provides a strong visual accent to the clean, simple lines of the house, while creating shade using a white shade cloth placed over the peaked portion of the structure. 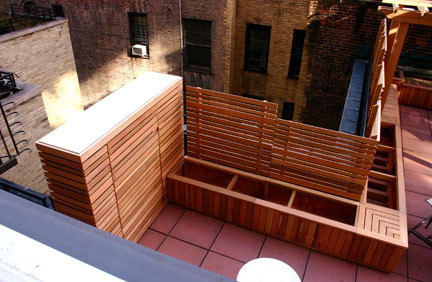 Acrylic panels were placed in the first three bays to protect the entry from rain, while allowing light in. 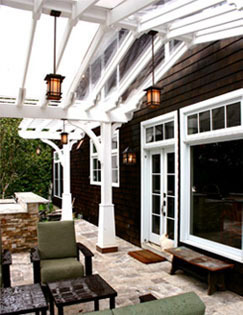 Cantilevered wings on either side frame the house and help to tie the patio, pergola and house together. The peak contains a wire chase to accommodate some very attractive lighting chosen by the client. 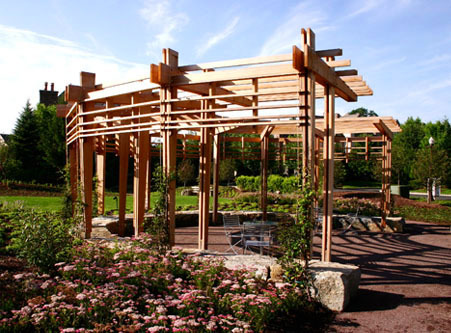 At the base of the tapered posts the plinths were wrapped in copper to prevent discoloration of the wood and as an attractive accent. 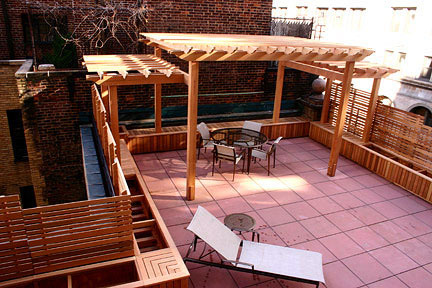 Scale and proportion were carefully considered so as not to overpower the house. 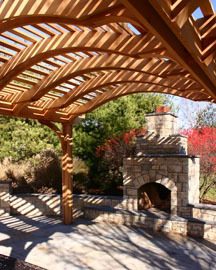 This large and detailed structure was designed to provide significant shade while framing the beautiful fireplace as a focal point. 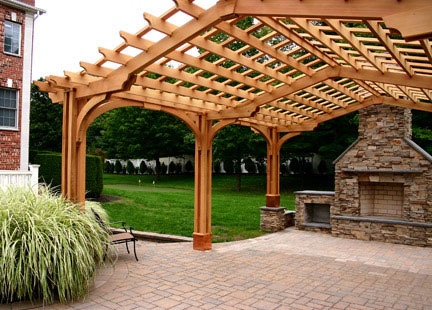 The arches and peaked top exist in the design of the house and were incorporated into the pergola as lateral stabilizers and as a means of spanning the 18' width, respectively. 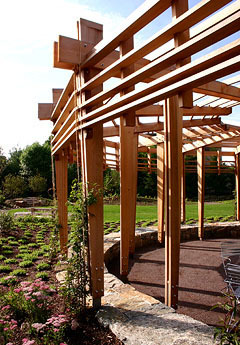 The posts consist of an assembly of four verticals capturing a center 6 x 6 post at the base. This allowed us to create a functionally and visually strong post that was open and not too massive in appearance. This design would work very well for climbing vines. 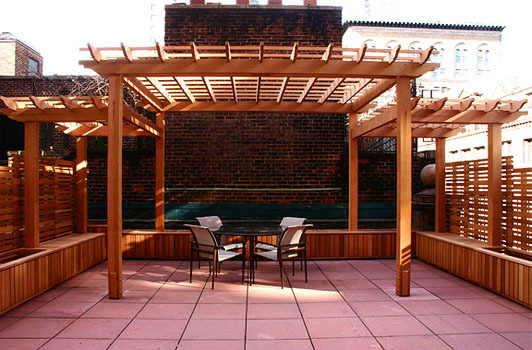 Copper plinth bases protect the wood next to the patio from water splash and conceal the stainless steel post attachments. 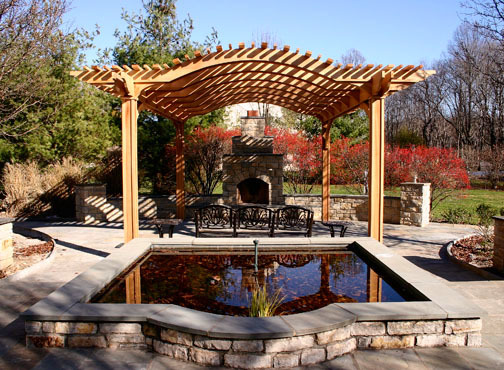 Located over a large patio area to provide shade, this magnificent pergola also establishes a strong focal point and gathering area between a fountain on one end and a fireplace on the other. 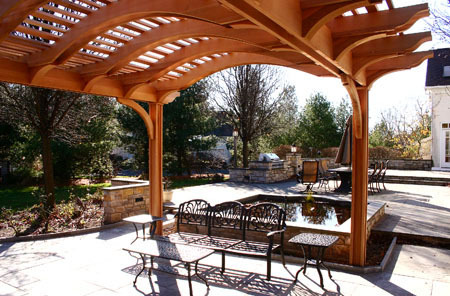 The overhead curve of the pergola reflects the large curved wall of the patio and accents the fireplace. 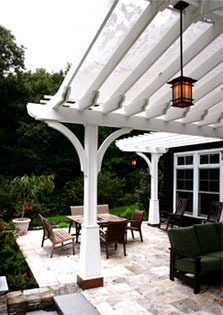 Double rafters sandwich simple support brackets. 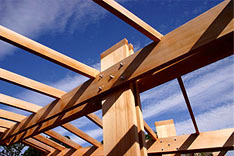 The brackets have been mortised into the main beams and shaped to continue the curve of the rafters. 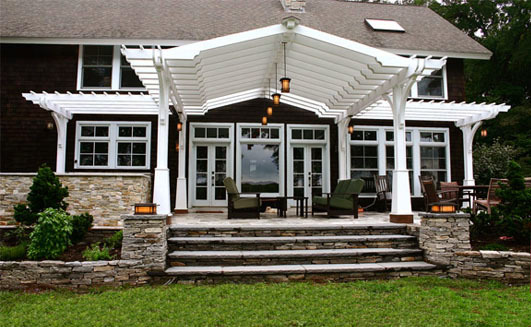 The purlins are quite dense and alternate between wide and narrow, establishing rhythm and visual interest while providing significant shade.